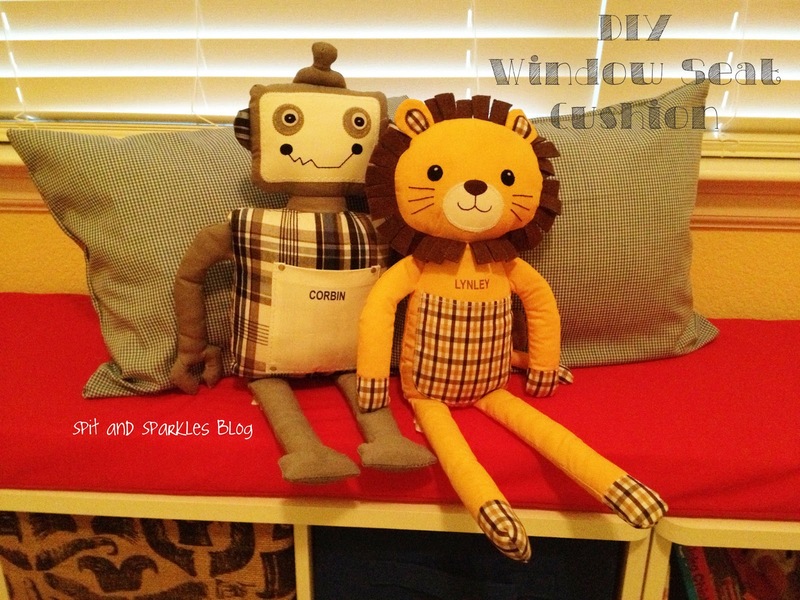 Project one, a.k.a DIY window set cushion, for Operation Play Room = DONE! I’m so excited to see the babies’ play room starting to come together. In case you missed the post about what theme we chose, it’s the Wizard of Oz! Take measurements of the bench, so you know how much Poly Foam to buy. We purchased two Circo Storage benches from Target, which put together is 70″ in length and about 14″ in width. I bought my Poly Foam from Hobby Lobby in this size: 1″ x 27″ x 76″. Cut the foam to fit the bench. Since our bench was 70 in. long and the foam was 76 in., we needed to cut at least six inches off. We ended up cutting a little extra off to leave about one and a half inches of space along the edges. popping open, you ask? Lay on top of it until it dries! Or do what we did after I stopped being silly, and stack those benches on top of the foam. You can also just use heavy books. Leave it over night, and you’re left with a new cushion! Make your cushion cover. Cut two pieces of fabric about one and a half or two inches longer and wider than the length and width of the cushion to allow for the seam. Turn your fabric right sides together, so the wrong side is facing up and facing down. Sew around three edges. Turn right side out. Stuff the cushion inside. You might be wondering how you close up the remaining side of the cover. Simply fold in the fabric, like you would to make a hem. You could sew it, but there would be a noticeable seam. Instead, use Heat n Bond and your clothing iron to fuse the fabric together, leaving a nice seam that looks sewn. This is very durable! I messed up and tried to undo the bond, but it started ripping my fabric! Secure the cushion to the bench using four sets of large Command Strips. 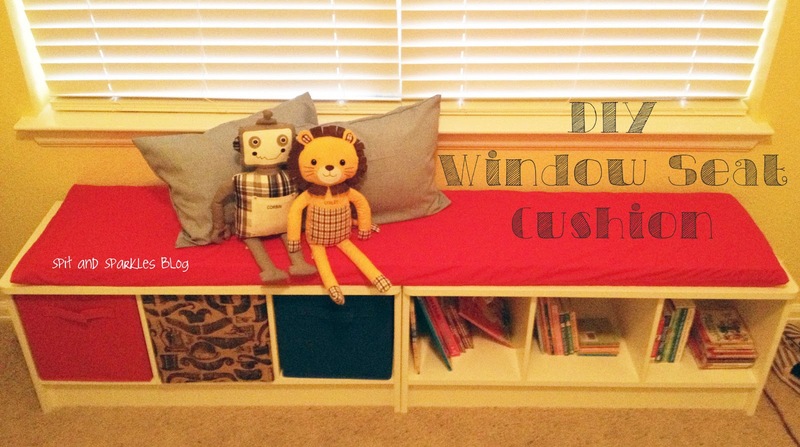 And voila, you’re left with a comfy new DIY window seat cushion that looks store bought. Add a couple of throw pillows to complete the look. You can make your own pillow cases to re-purpose some pillows you already have by following the steps you used for cushion cover. I actually bought two pillow forms from Hobby Lobby to stuff inside my pillow cases. This is way cheaper than buying already made ones, and a better idea if you’re looking for a specific pattern. Hobby Lobby also sells really cute already made pillow slipcovers for CHEAP! But, we needed some to look like Dorothy’s dress, hence the DIY pillow cases. P.S. Notice the middle storage bin? I actually recovered a colored one with some awesome burlap I found that looks like Oz the Great and Powerful’s hat, mustache, etc. But it didn’t turn out great… I might ditch it and use the burlap on something else. Stay tuned!